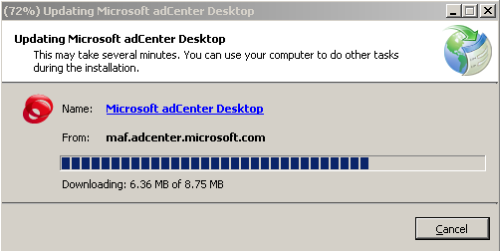 The public release of MSN Adcenter Desktop Client is now available for download. It works pretty much like Google’s Adwords Editor, and helps a lot in managing online advertising campaigns run on Microsoft’s advertising network. I suggest you use Microsoft Internet Explorer, click on the download link and select run/open to get the thing installed. I once tried to download this while it was still in private release in Firefox, and I had to install a firefox extension (i forgot which one) in order to run some .manifesto file extension to complete the install. No joy with Opera or Chrome either. Let me know if your experience varies. BTW, if you already had Adcenter desktop client installed previously, it will simply prompt to auto update itself to a newer version, as can be seen from the screenshot below.